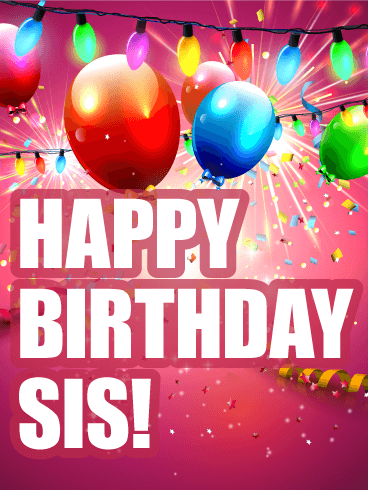 Happy Birthday Sis - Have a great day! These pretty butterflies have a special birthday message to share! 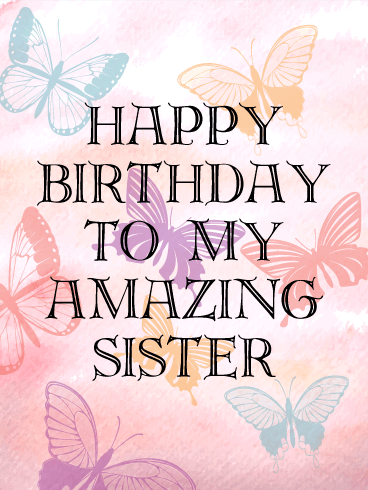 Short and sweet, your sister is amazing! 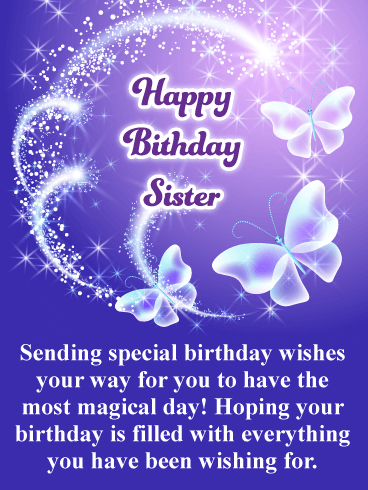 Send the wish that you hope her birthday marks a new year of beautiful transformation and abundant blessings. 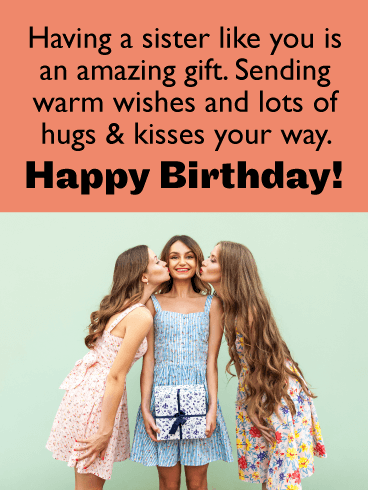 The bold font and warm colors make it a stunning birthday card to send. We know! Your sister is the greatest! That's why this birthday card is perfect for her! 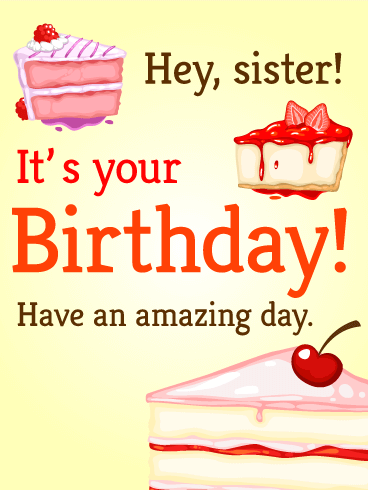 Send a yummy cupcake card and treat your sister right. Got a sweet-tooth? Who doesn't on their birthday? The va-va voom hot pink card makes the cupcake look good enough to eat. 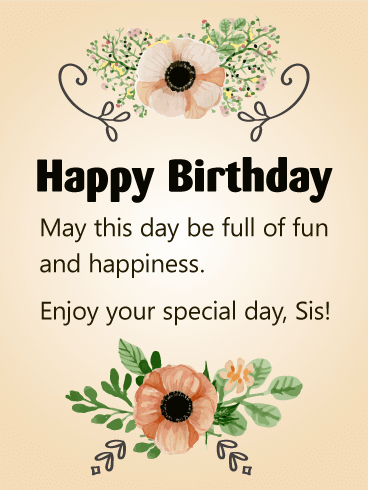 It's a great birthday greeting for your awesome sister. 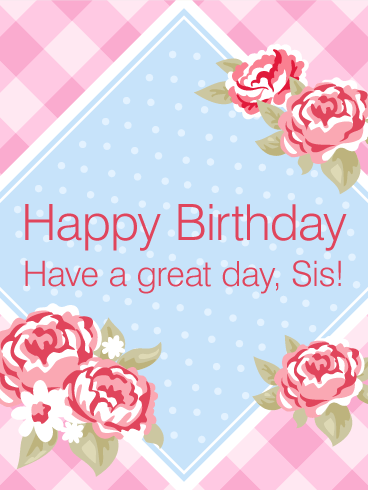 Don't hesitate to add some excitement to her birthday and send her this sassy card today. Oh, yum! We've whipped up this tasty birthday card to make your sister drool! The yummy cakes mean it's time to celebrate! 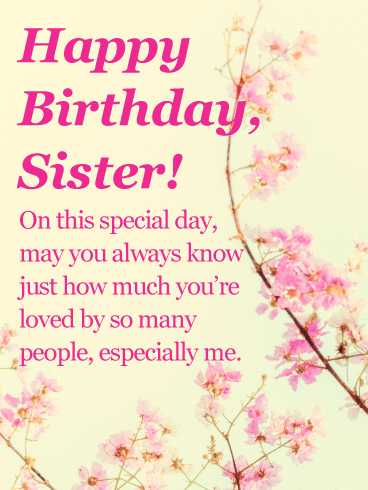 Make your sister smile with this cute, birthday greeting. 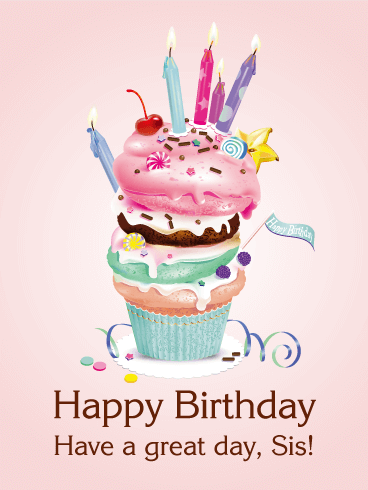 Pretty please with a cherry on top, send her this perfect card and wish her an amazing day! What a treat! 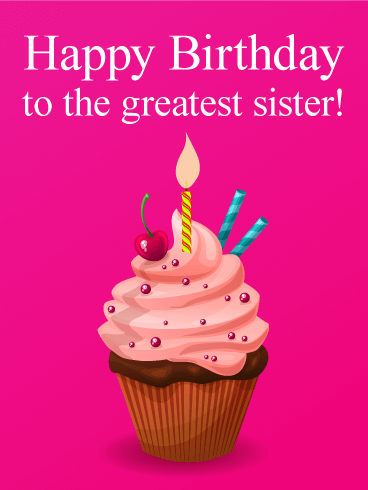 Celebrate your fun-loving sister with this whimsical, cupcake card! The festive colors, confetti, and candles will let her know it's time to party! For the girl with a sweet-tooth, this birthday card is sure to delight! Send these happy birthday wishes now. 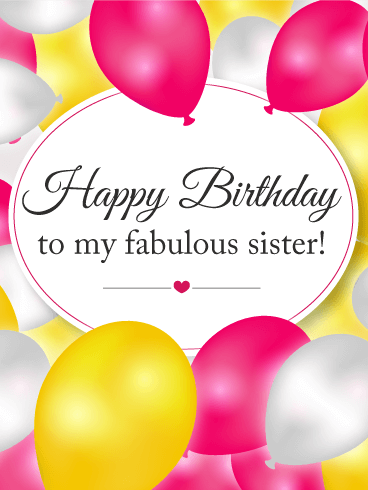 Satin balloons are an elegant way to tell your sister she is fabulous! Make her feel like a diva with this festive birthday card. The pink, yellow, and white balloons will make her want to kick off her shoes and dance! Be fancy, have fun, and party on! What would we do without our sisters? They are our forever friends and our strong supports through all of life's ups and downs. 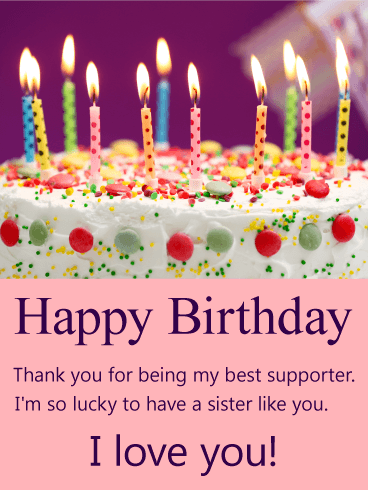 On your sister's birthday, why not let her know how thankful you are for her, how lucky you feel, and how much you love her? This birthday card says it all. Simple and sincere. A perfectly frosted cake with candles ready to be blown out will inspire the deepest wishes for a year of dreams come true. Let the good times roll! Hanging out with your sister is always a party, but her birthday is the best time to really celebrate! Send this flashy birthday greeting that is party rockin' and electric with energy! It's like a disco in a card! 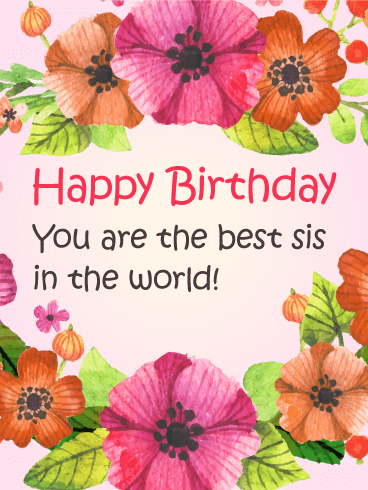 Your sister will love this wild and bright birthday card guaranteed. So, get your dance shoes on and get ready to raise the roof!